Larry Luttinger is eclectically employed as arts administrator, percussionist, and music educator throughout Upstate New York. He is the Founder and Executive Director of the Central New York Jazz Arts Foundation, Inc., a not-for-profit performing organization that presents jazz in concert, cabaret, scholastic, and festival settings across the region, to an annual audience of 58,000 in public and in schools. 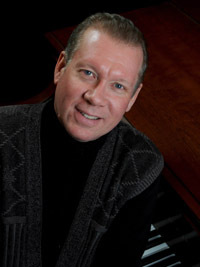 Luttinger has served as Chairman of the Syracuse University Music Industry Departmentand Director of SU Jazz Ensembles. He has also chaired the Music Departments of the Summerfame High School for the Performing Arts and the Metropolitan School for the Arts, and he was Executive Treasurer of the International Association for Jazz Education-NYS Chapter. He is recipient of the 2008 Updowntowner Award for Excellence, the 2010 Civic Morning Musicals Ruth Edson Award, the 2010 Cazenovia College Jazz ‘N’ Caz award, and is a member of the SAMMYS Hall of Fame and the Liverpool Fine Arts Hall of Fame. As a performing artist, he has been a member of the Syracuse Symphony Orchestra since 1986, he is currently a member of Symphoria, and he plays drum set for the CNY Jazz Orchestra. He recorded and toured extensively for the award-winning Society for New Music during his 14-year tenure as their percussionist. He has performed with many well known jazz artists, including Rob McConnell, Clark Terry, Grady Tate, Frank Foster, Benny Golson,Jimmy Heath, Slide Hampton, Buddy DeFranco, Doc Severinson, Bucky Pizzarelli and Howard Alden, Lorne Lofsky, Lena Horne, Maxine Sullivan, The Four Freshmen, Phil Woods and Antonio Hart, among many others. He has more than 50 touring show credits including Sugar Babies, Grand Hotel, City of Angels, Will Rogers Follies, The Producers, Frank Sinatra Jr, Aretha Franklin, Ben Vereen, Suzanne Somers, and Johnny Mathis. He has toured or performed with dozens of rock personalities, including ChuckBerry, Del Shannon, Chubby Checker, Petula Clark, and the Moody Blues. Luttinger lives in Liverpool, NY with his wife Margaret, an organizational performance consultant, and their sons Jake and Max.